Although these media reports and personal testimonies are subjective and not subject to academic scrutiny, we have reproduced them to help demonstrate that problems around religiously selective admissions are not abstract or hypothetical, but are a real life issue. Yesterday my partner towed our daughter in the bike trailer to her school. I cycled alongside – against the flow of pupils headed for the local school by car and by foot. It was a tough slog up the hill. I will not be able to tow a trailer up that hill. So on the days when I take her, we will walk. The shortest route is not a pleasant walk, nor to cycle, as it follows main roads. There are no bus links and it’s headed out of town; the wrong direction for work. Mid-morning the Head of the school next door to our house phoned. There’d been an error, she said, our daughter was not first on the waiting list in July; the council has got it wrong. We were second, or used to be. Because then a latecomer joined the list with a religious reference so actually we were 3rd. Or used to be. Because now there’d been some churn and the two kids, who we didn’t know were in front, had got places. So now our daughter IS actually first on the waiting list. And this is good, the head said, because at 0.07miles from the school she is the closest of all the children who are close! Are you following? No, neither did we. I think she was saying that it is positive that our daughter is top of this list of children who won’t get a place. No one can get in ahead of us on proximity! Which, yes, could be good, if the school did not consider proximity to be almost irrelevant in deciding who would be admitted. She then asked what school our daughter is at, if she has started and were we still be interested in changing even once she is settled. I explained the distance, that there are no buses, we don’t have a car and there are 3 closer schools, so yes we’d change. We’d settle even for the third closest as we could share school runs with the neighbours. She immediately named the neighbours’ kids I meant. I was impressed. She may even know all the names of the local kids her school rejects. I thought this must be something to do with calling themselves a ‘community’ school. And even though I didn’t say this… she went on to talk about the community school label, to say that she doesn’t agree with the religious selection policy, that it’s distorted in recent years so that few children in the community get in. She hopes it will change soon. In fact she thinks it WILL change soon (note to self…she has said this before in previous years… don’t get excited) but waiingt lists will still be assessed according the rules of the year of the original application, so actually no difference for us (see? Do not get excited). I told her that I didn’t understand the purpose of selection; I know people from another faith who get places. She took pride in this – ‘yes we are a multi faith, multicultural school, as we should be’. ‘And you rank all these faiths in order of importance!’ – No, I bit my tongue just in time. Parish C of E, then out of parish C of E, then RC, then Methodist, then Baptist, then Presbyterian, then Mormon and other Christian faiths, then Islamic, Hindu, Sikh, Jewish, Jehovah’s witness and other faiths. Agnostics and atheists. Agnostics and atheists rank equally last, but, if you were to ask me to get into the spirit of these selection criteria, agnostics should have the edge. At least we haven’t entirely rejected all faiths. I, like many baptised, confirmed and then lapsed Irish people, am agnostic. I think it’s hard for people like me to become a proper atheist. My partner is an atheist. He attended a Church of England primary. Our daughter has actually recently become a big fan of Jesus. She found Him on a hill in South America and we haven’t held her back. It will be her choice. However we haven’t signed her up to a church, because we are not members of a church. Some might say, if we were so keen she goes to the school next door, that we should play the game. I think that would a terrible introduction to a faith for her. Lesson 1: the art of discrimination. Lesson 2: hypocrisy. To challenge it, I need to understand the spirit of the selection. I can understand a C of E school wanting to serve its parish, and would not consider it particularly unfair if they selected 10% from the local church; in line with their funding. But what’s the deal with prioritising any faith over those without a faith? Is this about uniting against the godless? Then. if that were the case, why prioritise C of E outside the parish over Roman Catholics and RC over Hindus or Jews? Could it just be simply Ofsted rating chasing; they think that parents who make the effort to go to church are more likely to take an interest in their child’s education? I attempted school pick up yesterday. I cycled up to the school with her scooter on my back rack, but coming back was a struggle. My four year old was exhausted and just whined. The pavement is too narrow to walk side by side, the surface too potholed for her scooter and there’s a lot of traffic. Halfway back she refused to go any farther and I called her dad to come pick us up with the trailer. This on a fine dry day – what will it be like midwinter? Her father won’t be able to do this every day. We’re not in the worst situation. She has a school place when many don’t. Some kids have to travel even further. So I am not complaining, but I am angry and I don’t know where to direct this anger. If it’s not the head. And it’s not the Church of England (the Bishop of Oxford has come out strongly against selection). It could be the governors. It could be the local Diocese. It could be the council and Government, which provide almost all of their funding yet allow 100% selection on religious grounds. It could be all of them and none. I think they all bear some responsibility. While all of them, bar perhaps the governors, profess that they, they personally, don’t like the situation either, not one of them feels tasked to change it. From my garden I can see the playground next door and hear the kids on their break. My ideal is that my daughter will be able one day to walk alone to primary school, not be trekked along main roads to the next neighbourhood. None of the parents who park their cars outside our house want that, neither for my child nor their own. This morning we saw our neighbour walk his children the opposite direction to the third closest school. They are part of the local diaspora; the children allocated out to other areas. If even anyone else near us was going to our daughter’s school it would help; she’d walk more easily in the company of other children – though the pavement’s widths and the busy roads would still be a problem. THE YOUNGEST child of four has been denied a place at the same school as her siblings after her mum was unable to visit church due to illness. Stephanie Weaver, from Olton, was a regular parishioner at St Margaret’s Church of England for over 13 years until she was struck with personal difficulties and illness this year. Despite ‘a difficult year’, Mrs Weaver still attended church with her children 22 times so was outraged when her youngest child was denied a place at St Margaret’s CofE Primary School, simply because she had not made the minimum of 30 church visits. “There was no compassion,” she said. “They haven’t taken into account my personal difficulties, which they were fully aware of, or the effect on my daughter. They know what a year we’ve had. It isn’t Christian. “You can be part of a community for 13 years, and you can’t get your numbers up for one year and that’s it. You’re out. Mrs Weaver appealed the decision but says she was told she had not met the admissions policy and it was refused. She has now had to find a place for her youngest at the nearest church school, a 25-minute drive away, and has been forced to take her other daughter out of St Margaret’s, and away from her friends, to attend the same. A CHILD has been refused a place at a faith school two doors away from her home – and she is a practising Catholic. Angel’s mum, Annabelle Taylor, now faces taking her three children to three different schools in September. Her eldest Cameron, 11, is starting at St Thomas More High School, inWestcliff. Sapphire, seven, is a pupil at Sacred Heart Catholic Primary School, in Windermere Road, Southend where they live. But despite being a churchattending Catholic and living so nearby, as well as – at the time of applying – having two siblings at Sacred Heart, Angel was refused a place. The five-year-old will instead be going to Bournemouth Park Primary a mile away, in Bournemouth Park Road, Southend. Annabelle said: “I’ll have to take Sapphire in ten minutes early and leave her in the playground. “I had to do that the last two terms with Cameron and Sapphire. Then I’ll walk Angel down to her school. “But Cameron will have to get the contract bus. I’d prefer to take him myself, at least for the first week. It’s a big thing when you’re 11 and he’s not exactly streetwise. “Angel is at the top of the waiting list for Sacred Heart, but we are waiting for someone to leave. Their situation is complicated by the fact Angel has recently had surgery to correct developmental dysplasia of the hip, which causes one leg to be shorter than the other. She is only just beginning to walk again after being in restrictive casts for three months. The family go to mass at Sacred Heart Church at least every fortnight. The application form asks parents if they attend church weekly, fortnightly or monthly. Annabelle said: “I was being honest and said fortnightly, but we often make it more. It’s disappointing. Annabelle appealed the decision, but lost. Sacred Heart received 96 applications for 30 places. James Courtenay, councillor responsible for children and learning at Southend Council, said: “There is a squeeze on primary places. We are very conscious of having primary places in the right areas. ‘St Bernard’s Catholic Grammar in Slough has a oversubscribed admissions policy which give priority in the following order: 1. Baptised Catholics, 2. Other Christian, 3. Other religion, 4. No religion. We have one child at this school, but due to increased numbers of Catholics applying it looks very unlikely that we will be able to send his siblings there, as we subscribe to no religion and are therefore bottom of the priority list. ‘I live about 300yrds from two schools which are state funded and my child had no chance of attending either (St John Fisher Roman Catholic & St Aiden’s Church of England). This was purely down to my religious beliefs and is doubly annoying when both schools will take pupils from up to 20 miles away. I was so upset by this I wrote to my MP and had a meeting with him. He said there were no plans to alter the status quo, he agreed that this selective admission procedure was indeed unfair and discriminatory but as these schools are performing well there was no need to “rock the boat”, so to speak. I pointed out that this procedure assessed my son on my beliefs and values and not his own. His overriding point was that these schools were the best performing and therefore should not be interfered with. I did say that it is easy to perform well when you can “cherry pick” the pupils you desire and this in turn leads to other schools performing less well with less academic and a lower social demographic. ‘Out of our eight closest state schools, five are faith schools. We cannot send our daughter to them because they discriminate on the basis of religion. Of the remaining three community schools, two are undersubscribed due to their poor reputation, and the only good school we are able to apply to has an effective catchment area of 0.5km (which we fall outside of). I believe this distance is low due to the number of people having to apply to that school as a result of the faith schools discriminating against them. We are currently exploring our options which include: 1) going to church as this is a requirement of getting into the faith schools, 2) moving closer to a good community school so we are in the catchment area or 3) sending our child to private school. ‘My family are active Christians and we wanted our children to be educated at a faith school so that our children could follow Christian ethics and morals, which we hope would be to their benefit in the future. Unfortunately however the faith school our eldest daughter was accepted at has an admissions policy that favours children of families that attend the local church over the children of families who already have siblings at the school. As a result our second daughter was not accepted due to the recent high birth rate and large number of siblings (28) applying to the school. We were one of eight families whose children have been split across the borough to attend different schools. We have found the whole process to be completely hypocritical. How can a policy that has the potential to split the family unit be promoted by a Christian faith based school? Surely they should be promoting and supporting the family unit not splitting it up! As an already practising Christian family we feel the policy is open to abuse by those who turn up to church to ‘get a form signed’ for a short period to the detriment of families already at the school. This situation has caused no end of stress and dismay to the families who have missed out. It can’t be right for families to have to endure a logistical nightmare of dropping their kids of at different schools, as well as having to buy separate uniforms and for young children to lose out on the support of having an older sibling when making the transition to a new school. It appears from discussions with the school that we would have had to move house and changed churches in order to guarantee a place at our chosen faith school. However we are happy with where we live and the church we currently attend and consider it unethical to move on both counts. Every Sunday for at least two years before his son reached primary school age, Andrew Penman, an atheist, went to the service at his local Anglican church. As he sat in the packed pews and looked around, the 51-year-old knew that a sizeable proportion of the parents in the congregation were there for the same basic reason as he – to get his child into the popular Church of England school that was literally on the other side of the road from his house. The family is one of a growing number prepared to go the extra mile, bend the rules or even break the law to secure a place in a good school for their children. On Friday – national allocation day for secondary-age pupils – thousands of parents found out that they had failed to get their first choice school. Families with primary-age children are still waiting to hear their fate. And it seems that the fear of rejection has been fuelling radical action. In a bid to whittle down numbers at hugely oversubscribed church schools, religious criteria is becoming ever more stringent. Faith schools across the country demand baptism certificates, while some in the South East, where the battle for school places is exceptionally fierce, want children baptised within six months of birth. At Sunday services, registers are signed to provide evidence for school application forms. Attendance requirements of at least 45 Sundays a year are not unusual. One father was amazed at how many pregnant women were at the baptism classes he was attending at his church in the run-up to his one-year-old daughter’s christening. The Office of the Schools Adjudicator investigates complaints that admission arrangements of state funded schools in England are unlawful. Calderdale Metropolitan Borough Council complained to the Schools Adjudicator about the Governing Body of St Mary’s Catholic Primary School in Halifax, as they had decided to reduce the pupil intake of the school to ensure that fewer children who were not considered to be Roman Catholic were let in. The school had been admitting about thirty Catholic children out of the forty it admitted in its year on entry for some years, and wanted to reduce its annual intake from forty to thirty. The Council objected to the proposal because the school was already oversubscribed and as there was an existing and worsening shortfall of primary school places in the wider local area, which would have been exacerbated; as the children who were likely to be most negatively affected would have been from a socially deprived ward, and as it believed the school’s consultation on the proposed change did not adhere to statuary guidelines. The Schools Adjudicator upheld the Council’s complaint, stating that the school did not meet the requirements for consultations as set out in Schools Admissions Code, or the Code’s requirement for fairness in admissions criteria. The Adjudicator noted ‘I think it unlikely, given the inherent unfairness associated with the change in the school’s admission number … that the change could be considered as a proportionate one to achieve a legitimate aim’ section 43, p10. ‘I live 100 yards from a good successful Catholic Secondary School and applied for my son to attend. We are Protestants attending Church regularly, but were refused a place at the School – even after appeal. The School buses Catholic Children in from 12 Miles away! A FAMILY have been left devastated and distraught after their youngest son was refused a place at the local school his brother attends. The parents of four-year-old Amar Khaliq desperately wanted him to join seven-year-old brother Aadham at Sacred Heart Roman Catholic Primary School, in Hartlepool, in September. But despite Amar attending Sacred Heart’s nursery for the past 18 months and the family living close by, he has been turned down by the over-subscribed school. Instead, he has been offered a place at a school almost two miles away. Parents Hamid, 38, and Asiya, 32, say it will be impossible for them to take and collect both children to school on time. Dad Hamid believes the school’s admission policy discriminates against non-Catholics. But the school strongly denied claims of discrimination and said it rigorously followed its admissions policy. Mr Khaliq said the refusal is distressing for the children. He added: “Despite my child having a sibling at the school, despite living a few hundred yards away in the catchment area and despite attending the nursery for the past 18 months he has been refused a place. The family were told Amar had not been given a place because the school had 129 applications for just 60 places and other children were given higher priority under its admissions criteria. Mr and Mrs Khaliq took their case to the independent Schools Admission Appeal Panel at Hartlepool Civic Centre but lost. Amar has been offered a place at St Joseph’s Roman Catholic School in Musgrave Street, Hartlepool, which is 1.7 miles away from the family home on Hart Lane. Mr Khaliq, a self-employed landlord, added: “It is not possible for both of us to be available all of the time and my wife doesn’t drive. The family have complained to the Local Government Ombudsman which will examine whether the appeal was carried out properly and a fresh appeal could be held if the original hearing was found to be flawed. Jeff Cook, acting headteacher of Sacred Heart Primary School, said: “We totally refute any suggestion of discrimination and in doing so would point to the fact that Mr Khaliq’s older child is already a pupil at the school. “Unfortunately, the school was very heavily oversubscribed for this coming year, with 129 applications for 60 places. “In allocating those places, the school rigorously followed its admissions policy which it drew up in conjunction with the Roman Catholic Diocese of Hexham and Newcastle and which fully complies with national legislation. “Where places are oversubscribed, faith schools are entitled under national law to give higher priority to applications from children who are members of, or who practice, the faith of that particular school. “The school has done everything it can to help Mr Khaliq and to explain the situation to him. MILL Hill faith school discriminated against a family with a disabled child by denying their daughter a place because they did not have time to take part in church activities, an independent inspector has ruled. St Paul’s Church of England School in The Ridgeway has been chastised for not offering the girl a place because her parents could not take part in church activities because they had to care for her sibling. In a report issued today Dr Jane Martin lists a catalogue of errors by the governors at the school, who caused “avoidable uncertainty and anxiety” to the parents by unreasonably delaying and then rejecting their appeal against the decision. She also criticises their refusal to tell the family initially why the application had been rejected and not telling them what position their daughter was on the waiting list. She said: “This case highlights a catalogue of errors which were all avoidable, if only basic systems had been in place. “The school did not treat the applicants fairly in that it did not take the disability of a family member into account. “This failure was then compounded by incorrect information, unreasonable delay, poor communication and then finally a mismanaged appeals process”. Problems started when the family were told their daughter would not get a place in the Reception class last April, because they did not take part in enough church activities. However, when the father asked to appeal he was told he must have a face-to-face meeting with the governors, which could not be arranged until July, before he could lodge the appeal. In the report Dr Martin says the purpose of the meeting was to “dissuade” parents from lodging the appeal, against the admissions rules of the school. She also criticised the governors for failing to hear the appeal until September, well into the next school year, when the child already had a place at another school. By failing to hold the panel by the end of the summer term, the school breached its duty under the appeals process, concluded Dr Martin. When the panel did meet it “did not consider properly the complaints” put forward by the parents, the report found. Dr Martin also criticised the dual role of the then chairman of governors Reverend Michael Bishop, who was responsible for writing references for prospective parents and judging them. This, she said, amounted to a “conflict of interest”, although he has since been replaced as chairman of governors. In her findings Dr Martin states: “As a result of the faults, the parents suffered months of uncertainty and were put to a great deal of time and trouble. Her recommendations include an apology to the family from the school, and an overhaul of admissions arrangements there, including telling parents why they have been refused a place. ‘My husband and I are non-believers. Our son, aged 10, is a believer and has attended Sunday school over the past 2.5 years. This would have been longer but we were surprised by his interest and slow to respond to his wishes to attend, which was detrimental to his Point Score for his unsuccessful application for a place at Twyford Church of England School. ‘We don’t wish to discourage him from pursuing his religious interests, but we are nothing more than bystanders. There are aspects to the school that we like: a bit more structure and a strong commitment to extra-curricular activities. Theo already has his Christian beliefs so we aren’t coercing him into something against his will. ‘This subject has literally been a curse since we decided ten years ago to move to the seemingly idyllic market town of Reigate in Surrey. Reigate is home to St.Bede’s, if you Google them this is the opening line: “The world’s only state-funded, fully ecumenical Christian comprehensive secondary school”. ‘The entry requirements for this school are draconian, offensive and support donating money and large amounts of time to church activities. When my daughter left primary school aged 11 she was not eligible to attend St.Bede’s although almost all of her friends did go….them and their parents pack out the churches every Sunday….it’s standing room only. Through no fault of their own…this frankly disgusting situation has turned the parents into hypocrites as they do anything to get their children into St.Bedes. ‘In Bolton an Anglican school used to admit Unitarians, but then recently stopped on the basis that Unitarians are not members of Christians Together in England, which is the definition of Christianity that they used. This is in contrast locally, where Unitarians are accepted and active in ecumenical organisations. ‘Some Unitarian families argued that they should be counted as Christians, as they considered them selves as such and I support them in this. ‘I have just moved my two children to a new school outside of our local community because the voluntary aided Church of England primary school closest to us operates an admissions policy based on faith. ‘My son was attending the school and we have waited for over two and a half years trying to get our daughter in, but places have been allocated to ‘Christian’ families. OFFICIALS from two of the town’s mosques have lodged complaints with Bolton Council about the admission procedures of Bolton Muslim Girls School. Senior figures at the Masjid E Ghosia Mosque, in Caroline Street, and the Noorul Islam Mosque, in Prospect Street, say priority is given to girls from the Deobandi movement, despite the wider Muslim community helping to fund the school’s establishment in 1987. But the school claims its admission policy was put together in consultation with a variety of “stakeholders” and that it is fair. In a letter to town hall chiefs on behalf of both mosques, Bashir Shama, secretary of the Masjid E Ghosia Mosque, said: “Having provided that support, the girls from our congregations are now being refused entry because the school’s management have chosen to provide priority to the Deobandi community. There are many different branches of Islam, but the three most common are Sunni, Shi’ite and Sufi. The Deobandi movement is one of the lesser known but is growing in popularity. Mr Shama said problems started when the school, established by the Bolton Muslim Welfare Trust in 1987, entered the public sector in 2007 and put together an admission policy that included giving extra points to girls from the Deobandi movement. Margaret Asquith, director of children’s services at Bolton Council, said the admission policy, which is under the jurisdiction of the school, was legal. On Monday, members of Bolton Council’s Executive agreed to expand the school from 450 pupils to 600 pupils, with a Year Seven increase of 30 pupils per year from 2012. The school is also to move to a new building as part of the £80 million Building Schools for the Future programme. Head teacher Mubaaruck Ibrahim said: “Prior to the school becoming a local authority voluntary-aided school, we were supported by a small section of the community in Bolton as well as Bury, Rochdale, Oldham and Manchester who demonstrated that support by sending their daughters to an Independent fee- paying school. “Since joining the local authority family of schools the school has formulated its admissions policy in consultation with a wide range of stakeholders. “It is no different to any other Faith School Admission Policy which relies on faith as an oversubscription criteria. 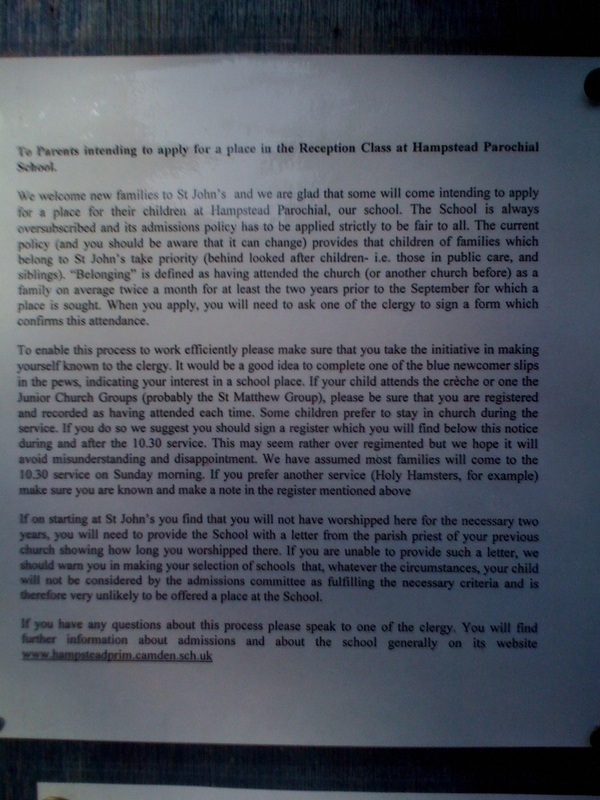 Instructions on a notice board at St John-at-Hampstead Church on how Church attendance can help parents get a child admitted to the oversubscribed parish primary school – photo of notice from September 2009 available at http://accordcoalition.org.uk/wp-content/uploads/2013/08/Hampstead-admissions-09.09.jpg. .
We welcome new families to St John’s and we are glad that some will come intending to apply for a place for the children at Hampstead Parochial, our school. The Schools is always oversubscribed and its admission policy has to be applied strictly to be fair to all. The current policy (and you should be aware that it can change) provides that children of families which belong to St John’s take priority) behind looked after children- i.e. those in public care, and siblings). “Belonging” is defined as having attended the church (or another church before) as a family on average twice a month for at least the two years prior to the September for which a place is sought. When you apply, you will need to ask one of the clergy to sign a form which confirms this attendance. To enable this process to work efficiently please make sure that you take the initiative in making yourself known to the clergy. It would be a good idea to complete one of the blue newcomer slips in the pews, indicating your interest in a school place. If your child attends the crèche or one of the Junior Church Group (probably the St Matthew Group), please be sure that you are registered and recorded as having attended each time. Some children prefer to stay in church during the service. If you do so we suggest you should sign a register which you will find below this notice during and after the 10:30 service. This may seem rather over regimented but we hope will avoid misunderstandings and disappointment. We have assumed most families will come to the 10:30 service on Sunday morning. If you prefer another service (Holy Hamsters, for example) make sure you are known and make a note in the register mentioned above. If on starting at St John’s you find that you will not have worshipped here for the necessary two years, you will need to provide the School with a letter from the parish priest of your previous church showing how long you worshipped there. If you are unable to provide such a letter, we should warn you in making your selection of schools that, whatever the circumstances, your child will not be considered by the admissions committee as fulfilling the necessary criteria and is therefore very unlikely to be offered a place at the School. ‘Having been a parent governor of a Church of England primary school I feel very strongly that faith was used to ensure a white middle class intake. Furthermore, when the school expanded its catchment area northwards when a nice estate was built between it and the secular primary school to the North, it opted to take in the whole of the estate (very expensive housing) into its catchment area, apart from a section to the very north, which was where some social housing was built. Those children had to go to the primary school to the North via the main road, even though our primary school was nearer and easier to get to via quiet back routes. As the school was its own admissions authority it could decide this was the fair thing to do, despite objections when it “consulted” with other schools in the area. ‘When I stepped down as a governor I took this issue up with one of the parent governors who told me that people had paid more for their housing in order to get into the school (best in the City) and they weren’t just going to open it up to anyone who wasn’t paying their own hefty mortgage! Vegetarians will be given priority for places at the UK’s first Hindu state school, it has been announced. The Krishna-Avanti school in Harrow, north-west London, will give places first to pupils whose parents follow Hindu teachings such as vegetarianism. But the Hindu Council UK criticised the plan, warning it would result in many Hindu children being excluded. School promoter, charity I-Foundation, said it was in line with admission policies at other faith schools. The school is expected to open next year, and is likely to receive a large number of applications from the UK’s 1.5m Hindus, 40,000 of whom live in the London Borough of Harrow. I-Foundation said the school’s admissions policy was intended to mirror those used by other faith schools that are oversubscribed. Director Nitesh Gor said: “In common with other faith schools – which may require letters from priests or proof of church or synagogue attendance – we want to give priority to those that are most active in their faith. “The definition we have arrived at includes regular home and temple worship, as well as vegetarianism and avoiding alcohol. But the Hindu Council UK said the policy could exclude most Hindu children. The council, which has previously backed the school, called for a meeting to discuss the admissions plans.